Welcome to the ugliest recipe I’ve ever posted. Oh… hey there. 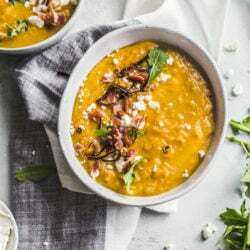 Loaded baked sweet potato soup coming right at you! You know that potato soup that you love so much? The one made with glugs upon glugs of heavy cream and cheese, only to be garnished with more cheese, crunchy bacon and green onions? At least you got some vegetables there. Yeah. Well, I love that soup. Like, L.O.V.E. that soup. I want to eat it every freaking day. Wait… does someone out there not like that soup? Because if that’s the case, I really don’t know how much longer we can continue this relationship. I made a version with sweet potatoes. Clearly. I don’t know why I act like I have to spell everything out for you. I think you’re pretty smart. 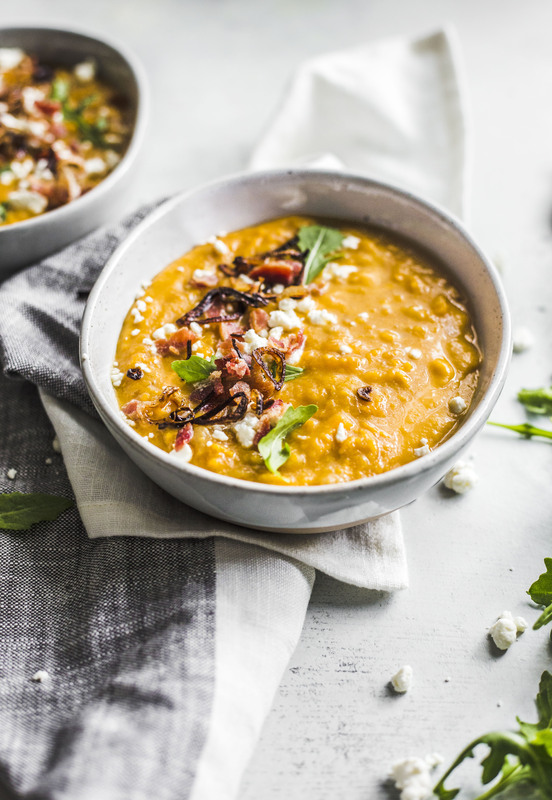 My “loaded” idea of sweet potato soup comes bearing a dollop of mascarpone, crumbled goat cheese, crispy, caramely shallots and obviously… bacon. Duh. It’s not like I was abducted by aliens or anything. But the actual soup itself is fairly heathy, which always means one thing… more room for toppings! Did you expect anything less of me? I think not. Prepare potatoes: peel and cube sweet potatoes, then add to a microwave safe bowl. Microwave on high power for about 10 minutes or until fork tender, tossing 2 to 3 times during cook time. If you do not want to use the microwave, throw the potatoes on a baking sheet with a drizzle of olive oil, salt and pepper (you can omit/add less salt and pepper later if this is the case) and roast at 400 degrees for about 35 minutes. Using the microwave will help this soup come together in 30 minutes. Roasting the sweet potatoes adds a bit more "caramely," deep flavor. Heat a large pot over medium-high heat. Add butter and diced onions and cook for 5 minutes. Stir in garlic and cook for 1 minute more, then add flour and whisk continuously to create a roux with the onions. Cook the onion roux for about 2 to 3 minutes, until it starts to golden in color a bit and smell nutty. Add in stock, milk, smoked paprika and potatoes, then bring to a boil. Simmer for 15 to 20 minutes over medium heat, stirring often - especially scraping the bottom. The potatoes will begin to bread down at this time - if they are not as broken down as you'd like, mash a bit more with a fork. Turn heat down to low and add salt and pepper. Taste and adjust seasonings according to preference. If you'd prefer a thinner soup, add more stock to thin it out. You can also throw the soup in the blender to make it super creamy. Serve hot with garnishes of crumbled bacon, mascarpone cheese, goat cheese, and crisped shallots. Note: to crisp the shallots, I sliced 2 whole shallots very thinly, add a little canola oil over medium-high heat, and once hot added the shallots. I cooked them for about 2 minutes, then removed with a slotted spoon and let drain on a paper towel. So good. Don’t hate it because it’s [not] beautiful. WOW !! I just cooked this soup today and it is SO good. I feel like a chef now, thank you! I added just a small tablespoon of peanut butter and it tastes perfect to me. made this tonight, fantastic!! even the hubby loved it, and he usually only likes broth soups. made everything right down to the fried onions. will make again and again! So so good. Ours was really runny, and when it was done simmering was just potatoes floating in a clear broth. So I stuck my immersion blender in there and boom! Turned it into a creamy delicious soup. Thanks so much for this! I put every topping in and especially loved the goat cheese. I made this last night and had it this morning for brunch – I just had to leave a comment… It was AMAZING!!! I had no idea how it was going to taste with the sweet potatoes and bacon, but it wasn’t really sweet! It was kind of like regular potato soup – BUT SO MUCH BETTER!!! YUMMMM!!! This will become a regular menu item at my house for sure!!!! I also made your buffalo chicken sandwich for dinner last night and they were fantastic too!!! I am so happy I found your website! I just “liked” your FB page too!!! Thank you!!!!! Pingback: Welcome Fall. 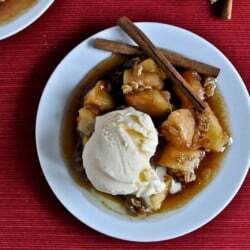 (Fall Cooking & Baking Wish List) | The Sweetest Thing. I just made this–it’s fabulous!! I sprinkled bleu cheese on top. WOW.